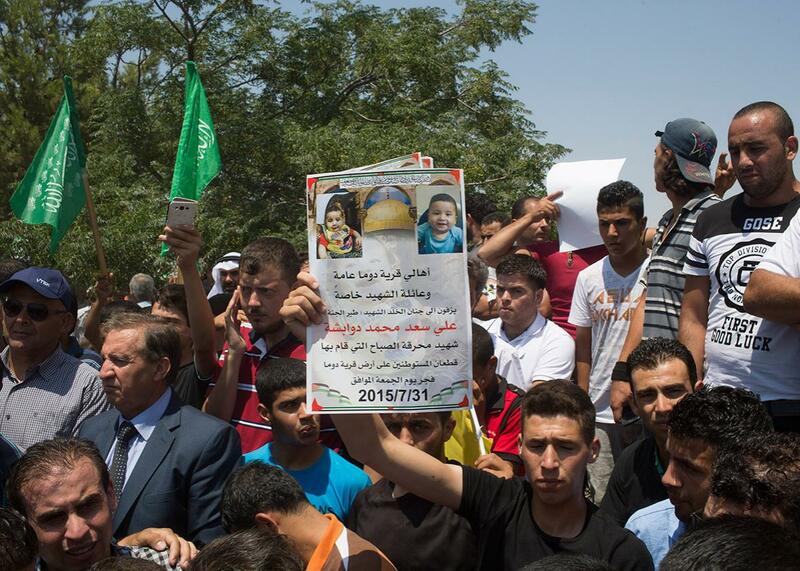 Ali Dawabsheh was burned alive by suspected Jewish settlers: Israel’s occupation has long abetted their crimes. The crimes of Jewish settlers have long been abetted by how Israel chooses to rule over the Palestinians. People gather in support of family members and relatives of 18-month-old Ali Dawabsheh as they hold his funeral on July 31, 2015, in the Palestinian village of Duma in the West Bank. It’s tempting to treat last week’s tragic murder of 18-month-old Ali Dawabsheh, burned alive in his bed as the result of a firebomb thrown by suspected Jewish settlers, as somehow separate from the occupation through which Israel has ruled the West Bank, East Jerusalem, and Gaza since 1967. Israeli officials have certainly been at pains to make that case, condemning the murder and promising swift action. But we should note that Ali was the fourth Palestinian killed over the previous week and a half. The reality is that Ali’s murder is only a particularly shocking expression of the violence that Israel’s occupation exacts upon Palestinian civilians every day. And any genuine effort to put a stop to extremist violence in the West Bank, by Israelis or Palestinians, requires a fuller awareness of how that extremism is driven by the occupation, and of the role that the U.S. has played in sustaining it. Don’t expect acknowledgement of the deeper problems here from the current Israeli government—it’s all in behind the occupation and settlements. While there’s no reason to doubt the government’s regret over the death of a child, it’s reasonable to ask how much that regret is actually worth while it remains committed to the policies that led to that death. Israeli Defense Minister Moshe Yaalon announced, “We intend to fight Jewish terror with our full might, without any leniency.” But of course he has no plans to end the system of radical institutionalized inequality that affirms and empowers Jewish extremists while containing Palestinians within a series of disconnected, impoverished cantons. Because of the international outrage that Ali’s death has generated, we can expect Israeli authorities to give the case special attention. Suspects will almost certainly be found, arrested, tried, and convicted. There will be claims that the system has worked. That will be false. The system is what empowered and enabled Ali’s murderers. For years, violent settlers have run rampant in the West Bank, protected by Israeli authorities, their crimes rarely investigated and even then only perfunctorily. These settlers draw support and affirmation from political leaders who insist that Jewish rights supersede Palestinian rights and who oversee a system that transforms that belief into facts on the ground. To their credit, Israeli civil society organizations like B’Tselem and Rabbis for Human Rights have been some of the most committed documentarians of these facts—for which they come under constant criticism by right-wing Israelis. In addition to these four recent Palestinian deaths—never mind the 2,314 killed last year, the most in any year since 1967—two other recent stories show that the problem is much more serious than just a handful of fanatical settlers. One is from the Palestinian village of Susiya, located in the South Hebron Hills in the West Bank. For months now, the Israeli authorities have been threatening to demolish the village and transfer its inhabitants elsewhere to make room for the growth of a nearby settlement. Even though the Palestinian residents own title to the land, appeals to Israeli courts have proven useless. The threatened expulsion has drawn warnings from both the European Union and the United States, not only from the State Department but also from Sen. Dianne Feinstein. On Sunday, the Washington Post carried a story by Nureddin Amro, a Palestinian resident of al-Sawana in Israeli-occupied East Jerusalem, detailing the Kafka-esque bureaucratic measures that Israeli authorities have used to justify demolishing his home and seizing the land on which his family has lived for generations. Amro’s story, like Susiya’s, is unique only in its details. There are hundreds of such stories across the occupied territories at any given time. This is the background against which individual news stories out of Palestine must be understood. Israelis certainly have a right to provide for their own security, but to justify the occupation on that basis is laughable to anyone even passingly familiar with the constantly shifting maze of regulations that Palestinians must contend with in their effort to live something resembling a normal life. As Americans, we don’t have to wonder how we’d react to an occupying power ignoring our rights while insisting on the superiority of its own: We fought a revolution over it. It shouldn’t be hard to understand why a young Palestinian might be attracted to violent solutions after watching years of nonviolent diplomacy produce nothing but more settlements. But the sad truth is that the Washington, D.C., policy community has shown itself to be incapable of addressing the reality of the Israeli occupation in any sustained or serious way. Indeed, in the through-the-looking-glass world of the Washington discussion about Israel-Palestine, it’s possible to find ostensibly serious commentators who deny that the occupation even exists. Republican presidential candidate Mike Huckabee insists it’s a fiction. And one of the party’s biggest donors, Sheldon Adelson, openly argues that the Palestinians aren’t even a real people. In its statement condemning the murder of Ali Dawabsheh, the European Union gave an important acknowledgement to the broader problem by including a line reiterating its opposition to continued settlement growth. The U.S. State Department unfortunately didn’t follow suit. If we want to empower those Israelis and Palestinians working to peacefully resolve the conflict and end the occupation, rather than those working to perpetuate it, that must change. Even as the United States has repeatedly criticized Israeli settlement growth, that growth has been sustained by years of U.S. diplomatic cover protecting Israel from any real consequences for it. As long as that remains true, we’ll see more acts of terrorism both by supporters of the occupation and by those determined to resist it.